Mirebalais is just an hour’s drive north-east of the Haitian capital, Port-au-Prince, but in terms of technological distance travelled, the town might as well be on another planet. On moonless nights, much of the capital is dark; its shacks and makeshift roadside stalls are lit only by flickering candles or small kerosene lamps. It could hardly be otherwise in a country where only about 20% of the 10 million population are estimated to have access to electricity, the lowest percentage in the Caribbean. 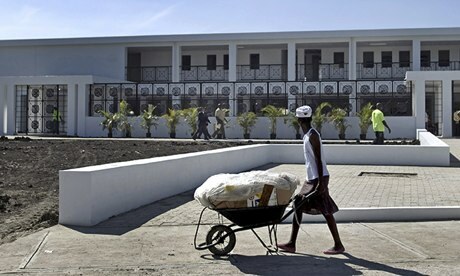 But Mirebalais is home to a new, well-lit public hospital that can hum with activity round the clock. Seven months after the world’s largest solar hospital opened its doors, its 1,800 rooftop solar panels have generated enough energy to charge more than 19,000 electric cars, run six surgical suites, attend to 60,029 patients and safely deliver more than 800 babies. “The number of deliveries is a pretty substantial fact considering that approximately three-fourths of women in rural Haiti give birth at home. The hospital is helping to meet a substantial unmet need,” said Jeff Marvin, of Partners in Health, which built the Mirebalais facility in partnership with Haiti’s health ministry. For Haiti, the hospital is a shining symbol of what the future might look like, powered by the island’s plentiful sunshine.